"Pizmon is the co-ed, pluralistic Jewish a cappella group of Columbia University, Barnard College, and The Jewish Theological Seminary of America. 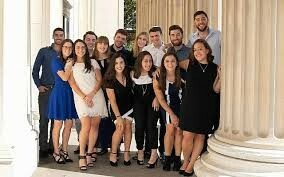 Since its inception in 1987 as the first collegiate Jewish a cappella group, Pizmon has traveled to hundreds of communities within the United States and around the world to share our love of Jewish music and culture. As a Jewish pluralistic group, we have members originating from nearly every Jewish background. Through our identity as Jews and our love of music, we strive to be role models for Jewish youth and enhance the religious experiences of Jewish communities of all denominations." Special guest appearance by the Ephlats of Williams College. Join with the entire Berkshire Jewish Community as we bid farewell to Shabbat with good company, music, warm hot chocolate and other treats. Co-sponsored by: Jewish Federation of the Berkshires, Berkshire Hills Hadassah, Berkshire Minyan, Congregation Ahavath Sholom, Congregation Beth Israel, Hevreh of Southern Berkshire, Knesset Israel, Temple Anshe Amunim. Funded in part by a grant from the Harold Grinspoon Foundation.